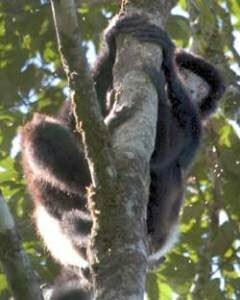 Research by Amy Dunham, a Rice assistant professor of ecology and evolutionary biology, detailed for the first time a direct correlation between the frequency of El Niño and a threat to life in Madagascar, a tropical island that acts as a refuge for many unique species that exist nowhere else in the world. In this case, the lemur plays the role of the canary in the coal mine. The study in the journal Global Change Biology is currently available online and will be included in an upcoming print issue. Dunham said most studies of global warming focus on temperate zones. "We all know about the polar bears and their melting sea ice," she said. "But tropical regions are often thought of as refuges during past climate events, so they haven’t been given as much attention until recently. "We're starting to realize that not only are these hot spots of biodiversity facing habitat degradation and other anthropogenic effects, but they're also being affected by the same changes we feel in the temperate zones." Dunham's interest in lemurs, which began as an undergraduate student at Connecticut College, resulted in a groundbreaking study last year that provided new insight into a long-standing mystery: Why male and female lemurs are the same size. This time, she set out to learn how El Niño patterns impact rainfall in southeastern Madagascar and how El Niño and cyclones affect the reproductive patterns of the Milne-Edwards' Sifaka lemur. The lemur's mating habits are well-defined, which makes the animal a good candidate for such a study. Female lemurs are sexually responsive to males for only one day a year in the austral summer months of December or January and give birth six months later. Dunham's co-authors -- Elizabeth Erhart and Patricia Wright -- have done behavioral studies of lemurs in Ranomafana, a national park in the southeastern rainforest of Madagascar, for 20 years. Erhart is an associate professor and assistant chair of the Department of Anthropology at Texas State University-San Marcos, and Wright is a professor of anthropology at Stony Brook University and director of the Institute for the Conservation of Tropical Environments. "There aren't many species that have such long-term demographic data that enable us to look at these kinds of questions," Dunham said. "So this was a unique opportunity." The warming of global sea temperatures may "enhance" El Niño cycles, according to the National Oceanic and Atmospheric Administration. Dunham found that in Ranomafana, contrary to expectations, El Niño makes wet seasons wetter. "When it rains heavily, lemurs are not active. They sit there and wait for the rain to stop, huddling for warmth," Dunham said. Anecdotal evidence suggested heavy rains knock fruit off the trees when lactating lemurs need it most, and may even kill trees outright. Dunham learned from the data that cyclones making landfall have a direct negative effect on the fecundity – or potential reproductive capacity – of lemurs. The team also discovered that fecundity "was negatively affected when El Niño occurred in the period before conception, perhaps altering ovulation, or during the second six months of life, possibly reducing infant survival during weaning," they wrote. "Madagascar's biodiversity is an ecological treasure," Dunham said. "But its flora and fauna already face extinction from rapid deforestation and exploitation of natural resources. The additional negative effects of climate change make conservation concerns even more urgent."